(aka) Save America's Forests Fund Inc. Together we can end clearcutting, save ancient forests, protect wildlife, and restore nature in America, and save indigenous cultures and pristine rainforests overseas. Let's stop the destruction and leave Earth's wild treasures for our grandchildren. 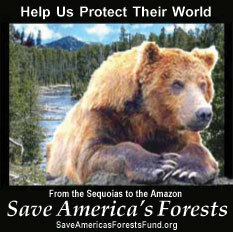 Save America`s Forests spans the globe in our efforts to protect forests and the animals that call them home. In the U.S., our efforts are focused on stopping clearcut logging and restoring biodiversity on our vast national forest system, and protecting the giant Sequoias in California, the largest trees on Earth. By protecting the forests, we keep them safe for animals from bears to birds, and badgers to bass. In the Amazon, we have shocked the world by revealing government and corporate plans to pave the rainforests, dam the rivers, and drill for oil. Our Yasuni campaign in Ecuador succeeded in stopping one of the largest oil companies in the world from drilling in the last untouched forest areas of Yasuni National Park. We worked with the government to remove illegal loggers from Yasuni. Our scientific research proved that Yasuni is the most biologically diverse place on Earth, with more species of wild animals like monkeys, pink river dolphins, jaguars, the world `s largest eagle, endless numbers of different insects and birds, than anywhere else on Earth, and many more species of plants and animals yet to be discovered. Our work in the U.S. and Amazon is supported by the top scientists in the world, including famous scientists like Jane Goodall and E.O. Wilson. We work as allies with the Huaorani Indians who have lived in Yasuni forest for millennia and are trying to protect their ancestral rainforest and way of life for their grandchildren. We also work with indigenous peoples to protect wild forests in Africa, Asia and the Pacific Islands. The deforestation of our Earth is catastrophic, especially the loss of the world's last remaining unlogged Ancient Forests, of which less than 10% remain. Our video of a rare Ancient Forest marked for logging in Oregon and a nearby clearcut is only 10 minutes and dramatically shows the beauty and the tragedy. It won 11 international video awards!